OBAMA PANDERS TO THE FICTITIOUS CROWD CALLED LATINOS……. – The Tundra Tabloids……. OBAMA PANDERS TO THE FICTITIOUS CROWD CALLED LATINOS……. 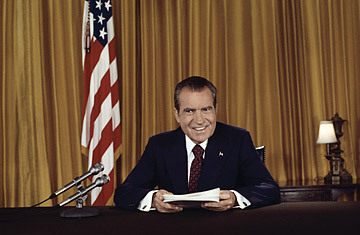 Nixon: Hey that was my crowning achievement! Marxists love to chop, slice-n-dice up society into their beloved “sectors, classes and groups”, all the while feigning support of society as a whole. The truth be told, they care little for either, in sections, or the entire whole of many parts. The marxist wants division of society, the ”have-nots” against those who “have”, racial friction, ethnicity division etc.etc., total envy against “the other” because it helps to keep and maintain their war against the individual. Marxists cannot tolerate the individual, for the individual stands in the way of their collectivism, therefor the very concept of individualism has to be destroyed if their plan of micro managing society is to be realized. It’s that simple. That’s why Leftists in general, pander to self identified groups as voting blocks, with conservatives (that become more liberal with each day’s passing) biting into the poisonous apple (of divide and rule) as well. Here is Obama in a traditional democrat form, pandering to what has been called for some time now, the ”Latino vote” (which is in fact a term concocted by, Richard Nixon, talked about by Mark Levin in last night’s radio broadcast 4/18). This is the creep of the multicultural mindset into American politics, and it’s got to stop, meaning, on both sides of the aisle. There is no such thing as a “Polish, Italian, Mexican, Catholic, Jewish, female, or gay vote”, there’s only an American vote, and politicians should devote their message on their best interests, not any one said group. There are no classes in US society, there are only individuals, who are free to move up the ladder and down it, according to their own work ethic. Redistributing the wealth of others to placate the gripes and complaints of “a certain group” is totally un-American and needs to be rejected out of hand. Previous Post Previous Post FRANCE PREPARES ITSELF TO VOTE FOR HOLLANDE……. Which is exactly why there could be a backfire to the Zimmerman case. If it turns out he committed no crime, there should be a quiet constituancy of several groups who were disgusted by this. Also, to group all people from Latin America together is a form of predudice in itself (besides not taking into account the normal divisions within any society) it groups largely conservative Cuban Americans with more radical Mexicans etc.